On entering the checkout stages of your order, you will be transferred to our secure server for extra security. Customers opting for a Paypal payment will be directed to the secure Paypal website where the transaction will be completed there. 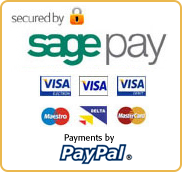 Customers selecting a credit or debit card payment will proceed to the Sagepay secure payment site, then transferred back to our order completion page when the transaction is complete. As a result our website now conforms to the new PCI compliance rules introduced recently, and ensures completely secure online card payments. and there is a padlock symbol at the bottom right hand corner. This ensures you have a direct connection with our payment server. Never trust giving your card details to any web site that doesn´t display this information. Please note: The above instructions were sourced from a microsoft forum and has worked for us. If you follow these instructions, you do so at your own risk. John Penny Restoration Ltd will not be liable if you cause problems with your computer. We strongly advise, if you are not computer literate, please ask professional advice. Remember - Even if you cant see a padlock, while there is an ´S´ after the HTTP you are connected to a secure page. When you have pressed the ´Complete Order´ button, the goods you have ordered will be placed in your account folder on our shop server. While your card details are encrypted and sent to us via an e-mail direct from our payment server. The secure site padlock is displayed to the right of the address bar. Click for confirmation and certificate details.